Tasks led by the Norfolk Wildlife Trust over the three-hour session were designed to tidy the area and enhance the different habitats for wildlife. Part of the plot is fairly damp, at least in winter, and certainly one small pond is established here in that season. 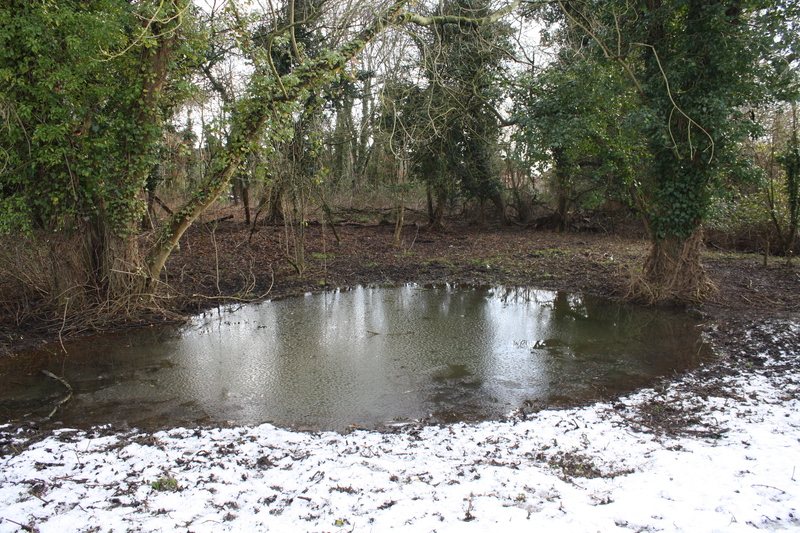 The pond which is established in winter, on the edge of Temple Wood. Some of the other volunteers were involved in trimming trees and shrubs. This work is part of the “Living Landscape” programme being carried out by NWT, so wildlife habitats can be improved and connected by “corridors”. The Reffley area is part of the Gaywood Valley Living Landscape in West Norfolk (the Trust is running a second similar project on the opposite side of Norfolk in the Bure Valley). The practical conservation tasks are supported by a variety of courses and talks to help make local people more aware of the wildlife sharing their patch and how to help it. The Reffley Temple area is so called as it is on the site of a former temple constructed in brick in 1789 for a secret society of Royalists known as the Reffley Brethren. The Brethren were formed in 1650, while Oliver Cromwell was in charge of the country. In 1750-1756, an obelisk dedicated to “Bacchus and Venus” was erected at the site of a chalybeate spring here – the basin of this is all that remains today and some of the volunteers cleaned it out on Monday. The spring has leant its name to the ancient woodland on the opposite side of the path in the centre of this housing estate. A small amount of one of the brick walls of the temple is still there and it is hoped that this may be preserved so local people can better appreciate the history of the site. It seemed quite fitting that some of the bricks from the temple were used for the hedgehog home. The land around the temple, which was used by the Brethren for social gatherings, was originally more open. but after the building was vandalised and demolished in the 1980s, the wood began to take over. 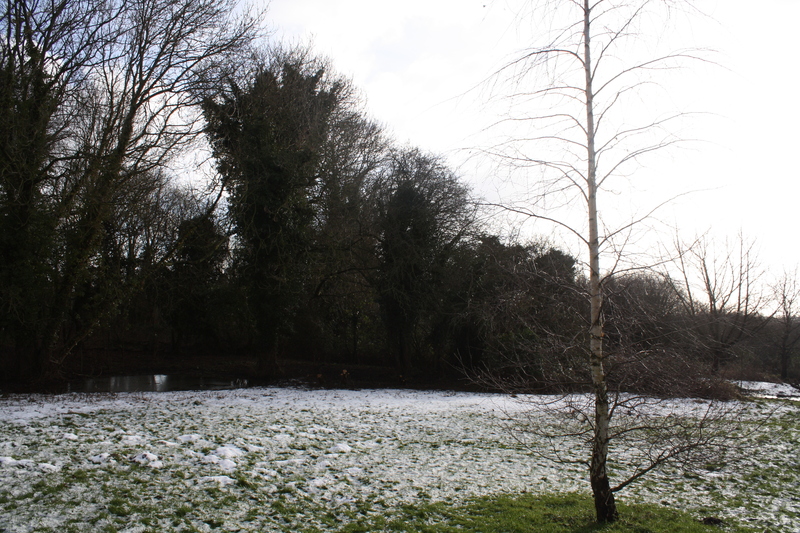 Part of the outer edge of Temple Wood, with the pond on the left. Taken earlier in the year after a slight snowfall. One prominent tree in a corner of this woodland is a sugar maple. Originally from Canada and North America, the sugar maple has been used to make a sweet syrup and its timber is thought to be very versatile. It is said to be beautiful in its autumn regalia and liked by birds for nesting and by squirrels, which eat its seeds, buds, twigs and leaves, so more on that as the seasons progress! At present, the tree intrigues me because its main branches seem to wander everywhere and there are lots of smaller, spindly branches going in all directions. The big tree in the centre of the picture is the sugar maple. 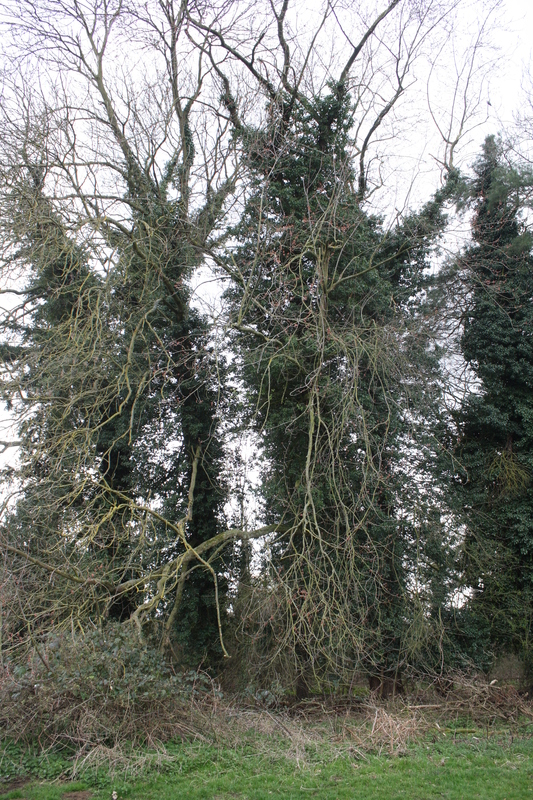 The spindly branches grow in all directions. The attractive buds and blossom. Dog’s mercury and a liverwort were discovered on the site as we walked round on Monday. A pair of goldcrests was seen flying around a tree in Temple Wood during the morning, so hopefully they may nest here this spring. A few weeks ago, I heard a song thrush singing from one of the trees. 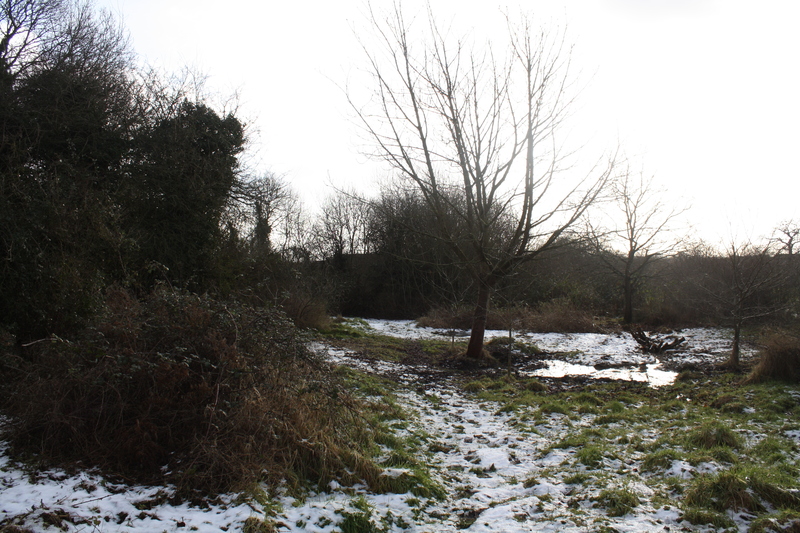 Another view of the outside edge of Temple Wood, again in winter and showing some damp patches.